On the journey back to town, Harukai asks Gundren to detail his experience during his captivity. Of especial concern is the shapechanger—anyone could be one of those in disguise. How can we tell if someone is actually a doppelgänger in disguise so we don’t, for example, rescue some dwarves from a mine and they murder us in our sleep on the way home since they are actually monsters in disguise? It is hard to tell but Gundren does disuss with Sildar about their capture by the goblins and some details could be difficult to manufacture without knowledge of those events. "In case we unknowingly run into any more shapechangers, Gundren, can you give us some information only your dwarven brothers would know so we can make sure we only rescue your kin?" After dinner, Harukai suggests they look at the map somewhere private and make plans to leave in the morning. Gundren suggests that everyone retire to his room in the inn and discuss in private. In the privacy of the room, Gundren opens his maps and begins to show everyone the location on the map of where the brothers made their discovery. Pointing to a spot east of Phandalin in the Sword Mountains "This here is the entrance to the cave, which we found was the entrance to the Mine of Phandelver's Pact. 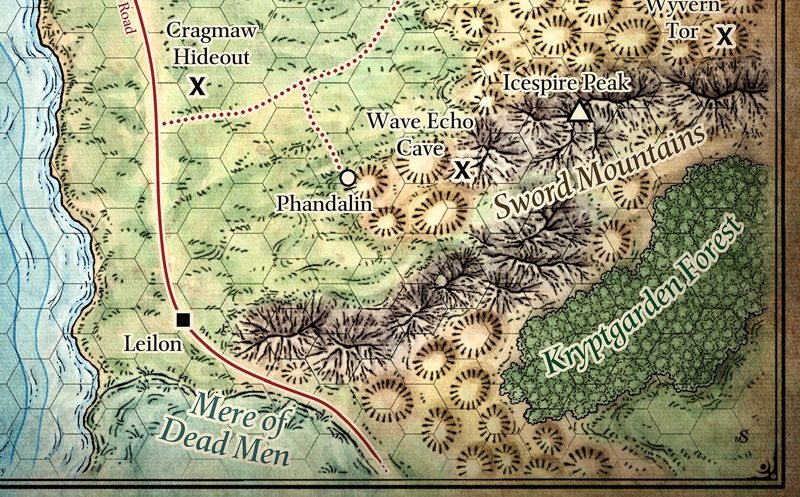 The story, for those of you who don't know, is that hundreds of years ago a clan of gnomes and dwarves worked together to open a mine in the Sword Mountains that was rich with resources. Upon further excavation of the mine, it was found that an area of great magic flowed through the deep chambers of the cave. Humans aligned with the gnomes and dwarfs to use these powers while helping the mining operation, but sadly evil individuals sought to take the cave for themselves. A battle ensued and the cave was lost for many many years until my brothers and I were able to discover it. We have no use or desire for the magical properties of the mine, but were definitely willing to contract its use to a noble group, for the right price of course. Whoever this Black Spider fellow is, he found out our discovery and formulated a grand scheme to take the mine for himself. Thankfully your group had derailed most of his plans and I hope you will continue to do so." "If you go to the cave and find my brothers I will be most grateful. My brother Tharden is a good fighter and will likely be standing guard while Nundro works on his equipment and projects. Nundro is attempting to automate some of the mine operations to save labor costs. In thinking of a way to tell them from the shapeshifters I would advise you to ask of our home village, which is named Sorrolk. Also, you can ask of our cousin who sometimes assists us when we need extra muscle on our business ventures named Flint Stouthammer. He was formally in the military and helps us from time to time. He has not been in this area so it is unlikely that the evildoers will know of him." "This is a trivial task, but I see no reason why we should abandon your kin to the likes of the Black Spider. You've clearly been through much, so I suggest you stay here to rest and wait here while we go deal with the problem." Jackson says to Gundren, turning to Sildar shortly afterward. "What about you, Sildar? After we rest here for the night, will you also see to the safety of Gundren's kin tomorrow morning?" Sildar says "Of course. I myself would like to locate this Black Spider individual and bring him to justice as well. His actions are detrimental to the peace of this region and the alliance desires that such peace be resorted and maintained." "Well said! I suppose it's settled -- we shall rest here and pick this up first thing in the morning! Good night to you all!" Jackson then goes over to Gundren, saying, "And again, old friend, it's good to see you safe." "Jackson, I agree just finding the dwarven brothers may be a trivial task. What comes after, though, may be more involved." Smiling at Gundren, he adds, "If I know my dwarves, I doubt they will want to leave the mine to the interlopers, so we will need to combat the black spider and his minions. Of course," smiles Harukai again, "it would be my pleasure to further aid our patrons, Sildar and Gundren". Well fed with simple, nutritious food and clean water, Harukai retreats to his quarters to rest and meditate so he will be ready at the break of dawn to set out once more. The group awakes feeling well rested but also stronger. Roll HP to advance to level 4. OOC: So, question about the staff--now that we are level 4, Harukai could take a feat (Magic Initiate) that allows him to use one of the spells in the staff--most likely the shield spell. That could be a reasonable defensive option if the spell can be cast as normal (a reaction). I have read some forums, and there is some discussion about the wording of the staff use. Can it be cast from the staff as a reaction, or does it take an action? I still may not do it, as the ability score improvement would be great for Harukai, but I am considering it. The staff regains 1d6 + 4 expended charges each day at dawn. If you expend the staff’s last charge, roll a d20. On a 1, the staff shatters and is destroyed. Discussion is this: the action to cast shield is a "reaction", but the text says "use your action". Forum discussion is unclear, but a rare item that makes you take your combat action to cast a spell that normally can be cast as a reaction (and costs double charges) seems pretty underpowered.